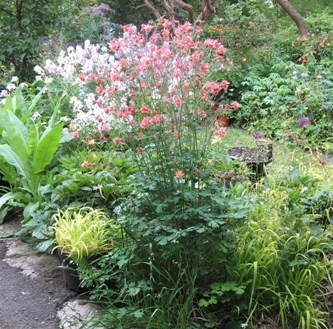 Aquilegias have been popular garden plants for many centuries. Unusual forms were not just collected here in the British cottager’s garden, but in many countries: a Dutch artist’s fourteenth century painting shows some VERY desirable double cultivars! It has always been the unusual colours and the double forms that are most sought after. There are very many species available, and my collection grows yearly however most are cultivars (and hybrids) of the commonest type grown here, our British native: Aquilegia vulgaris. 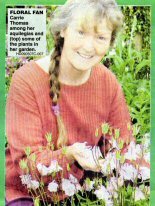 In 2004 my Collection was recognised by the National Council for the Conservation of Plants and Gardens (NCCPG) (now Plant Heritage) and is now a National Plant Collection® (NPC). Plant Heritage recognised my SECOND collection for full National Plant Collection status in 2009 which comprise the amazing doubles with yellow in them that I am breeding. Plant Heritage's aims are to: encourage the propagation and conservation of endangered garden plants in the <?xml:namespace prefix = st1 ns = "urn:schemas-microsoft-com:office:smarttags" />British Isles, both species and cultivars; encourage and conduct research into cultivated plants, their origins, their historical and cultural importance and their environments; encourage the education of the public in garden plant conservation. Through its membership and the National Collection Holders, Plant Heritage seeks to rediscover and reintroduce endangered garden plants by encouraging their propagation and distribution so that they are grown as widely as possible. For more information, visit the Plant Heritage website. I fell in love with the humblest of granny's bonnets, which was growing on my brother's plot when we were kids. I still feel the flowers are exotic in their unusual appearance, with their complex shape comprising 5 petals with hooked spurs and 5 petal-like sepals. The petals are shaped like a cornucopia or 'horn of plenty', and bear nectary-producing glands deep up it their tip where only the longer-tongued bumble bees can reach. Sometimes, though, shorter tongued bumbles steal the nectar by biting through the spur! American species may have petals with very long straight spurs as they are pollinated by moths with very long tongues indeed, or stumpier straight ones with red colouration which are pollinated by humming birds (birds see red, insects can't). 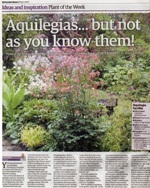 If only the wise know their true fathers, then Aquilegias are very unwise indeed! Indeed, the naming of cultivars is difficult as so many wrongly named plants and synonyms (same name for what appears to be the identical plant) exist. Particular trouble stems from Aquilegias needing to be raised from seed (rather than being vegetatively propagated as most Plant Heritage collections are). 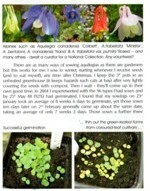 Seedlings always show natural variability but it is compounded in two ways with Aquilegia hybrids. Firstly, the plants are able to easily cross-pollinate between the species (and cultivars), and so, as seed production is invariably by open pollination, bees are busy cross-pollinating and ensure liberal mixing of genes in the next generation. Offspring are thus unlikely to resemble the seed parent in all aspects. Very little seed production is carried out under controlled conditions, which is done by growing the parent plants away from other Aquilegias , ie, outside bees foraging areas. Secondly, cultivars are complex hybrids, and may contain many recessive (‘hidden’) genes. This means that even if a plant was ‘selfed’ (that is, its own pollen used to fertilise itself and so produce seed), not all progeny would look the same. This is because offspring will show ‘throwbacks’ where recessive genes are exerting their effect, in the same way that two brown-eyed parents can (legitimately!) have a blue-eyed child. Thus, I ‘selfed’ a beautiful crimson-&-white pom-pom Aquilegia to discover its offspring were very variable indeed! The recessive genes showed up as single forms, less-than-pom-pom double forms and even plain crimson rather than bicoloured, the permutations were numerous! Carrie’s cry from the heart! Thus, I beseech you, never label an Aquilegia plant with a name until it has actually flowered and you are pretty sure that it appears true to type. Otherwise we continue to propagate myths of names along with the plants. Thank you. There are as many ways of sowing Aquilegias as there are gardeners, but this is what I do: I sow in winter, starting whenever I receive seeds (and to suit myself), anytime after Christmas. I keep the 3” pots in an unheated greenhouse (keeps cats etc at bay!) after very lightly covering the seeds with compost. Then I wait. They’ll come up in their own good time. In 2004 I experimented with the 96 types sown, and by 25th May I’d had 88 which had germinated (92%). and found that my sowings made on 23rd January took an average of 8 weeks 6 days to germinate, yet those sown ten days later (on 2nd Feb) generally came up about the same date, taking only an average of 7 weeks 2 days. Those sown a further 3 weeks later again (20th Feb) were slightly quicker again at 6 weeks 3 days. The longest took over 13 weeks and the shortest just 5 weeks 2 days. If you sow May-July they’ll germinate in about 4 weeks. I prefer to sow in January as there’s little else gardening-wise to do (or the weather’s too cold/wet/miserable). In March there’s plenty else I can sow, and need to do. I also sow alpines and bulb seeds at this time, basically as soon as I receive the seeds. 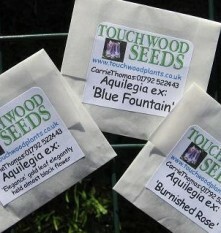 After germination, thin out to a reasonable number, certainly not more than twice the number you will ‘need’. You can thin out the green-leafed forms from coloured-leaf cultivars at this time (and for white flowered cultivars, select seedlings with no purple in their leaf stems*). Prick out when large enough to handle (don’t leave too long as root growth is rapid, as seen in the photo). First soak the pot with water, then tip out the contents and tease seedlings apart from the edge of the compost ball. I even prick out at the seedling-leaf (cotyledon) stage sometimes. 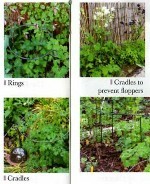 I place them directly where they are to grow on: either in nursery rows in the garden or in grow-bags. This means I need to ‘harden off’ seedlings for a couple of weeks beforehand……I just leave them in the relatively protected area between my shed and greenhouse. Planting into flowering positions may be done at any time from autumn to spring before the flowering shoot appears (though plants can be forgiving even when moved in first-flower stage, if treated understandingly). I have to pot each one up and keep until it flowers in May so that I know they are ‘true-to-type’ and can be correctly named and put into the collection. * I've discovered that this does not hold true for long-spurred cultivars, purpley stems can flower creamy opening to white, and non-purpley stems can give brightly bicoloured flowers! NB The other Plant Heritage holder, John Drake, advocated sowing immediately when ripe, otherwise a considerable drop in viability occurs. This may well be more important for other species. Strong winds, especially with rain, can flatten the flowering stems of your aquilegas. Some may never recover, others just no longer look their best. I've undertaken a trail of popular sorts, finding that all of them are far better than none at all! 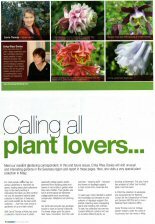 I've some strong favourites, to discover more, follow this link to the feature in Plant Heritage's magazine in 2012 where the results of the trial are discussed. Grateful thanks also to Brother and Suttons who enabled the trial to take place here at Touchwood. Here in South Wales we have a relatively warm and wet climate compared to most of the UK, and far warmer winters than many areas of Europe where my aquilegia seeds get posted to. It may be that colder, yet drier, conditions help some aquilegias survive better, especially their first winter. For comments about the American USDA system I can do no better than quote my friend Henry Fieldseth who runs local plants sales in Minnesota, follow this link. Need instant inspiration? See below for tempting types, and also watch the Byw yn yr Ardd Touchwood Aquilegia feature that was on TV and now available on Youtube (English captions are found by pressing the subtitle icon, 2nd one, bottom right). 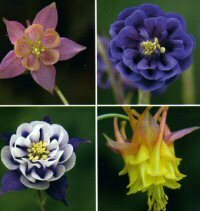 Also Robert Hock's Aquilegia video on YouTube as it shows many named forms, so visit http://www.youtube.com/watch?v=RyXAtj6hdwM and enjoy the show! What to grow? The choice is enormous and growing all the time, eg Ray Brown (Plant World, Devon) is doing amazing work on breeding new cultivars, especially coloured leaf forms and scented types. Here I list a few of my favourites. ‘Nivea’ syn ‘Munstead White’ White flowers, single. However, I have no idea which of the many white singles is the real 'Nivea'! Ones I grow may vary in height, flower size and spur length, so I always just call mine 'white single'! ‘William Guiness’(syn ‘Magpie’) ‘black’-and-white single. There is also a double form available, very desirable, but it does lack the dramatic simplicity of the single. Grow both! ‘Strawberry Icecream’, (Plant World). Exceedingly neat, pleated pink-&-white double, the colour changing halfway up the pleated petals. ‘AdelaideAddison’ A very beautifully formed frilly double in a striking indigo-blue and white. Beware impostors! stellata forms star forms, also known, most descriptively, as ‘clematis-flowered’. Strange: the usual intricate flower form has mutated into a flattened structure. Delicate but decidedly different! The white form is delightful, ‘Blue Fountain’ is marbled blue-purple, and 'Sweet Dreams' is a remarkably pretty pink with variegated leaves. Yes, I do like the rich, deep colours, but don’t forget that the lighter ones always show up better in the garden. 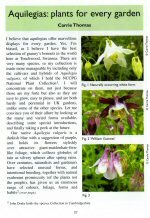 For a printable A4 double-sided leaflet with much of the above information on Aquilegias, please contact me by e-mail, or request one to be included in your seed order, or send an SAE and I will send one. 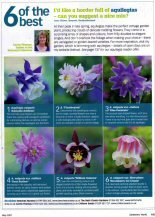 It comes free when you order Aquilegia seeds, or you may download a copy here. 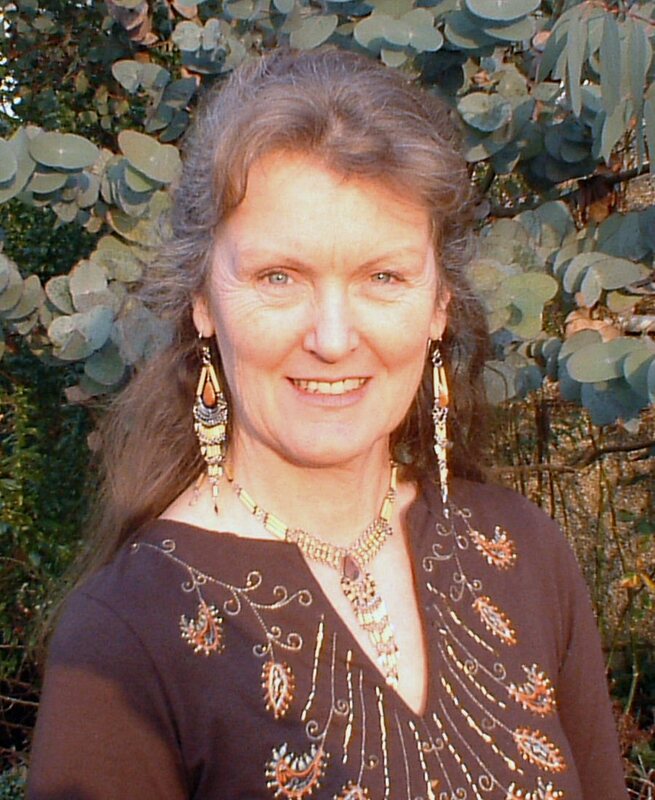 I think you should make a small charge for people using you web site – it is fantastic. I bless the day I checked last year’s Plant Finder and found your details. Best Wishes Dennis Moore ....I am still wishing I had discovered your site years ago. Dar Carrie, Seeds safely arrived in the Yarra Valley in Victoria- funny to think they grew in Wales and will now be planted and flower again in Australia! My first email to you was on Friday and the following Wednesday the seeds are in my mailbox in Switzerland! 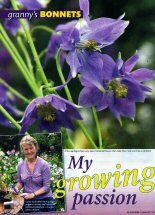 Faster is not possible... thank you very much, I am looking forward to have such beautiful aquilegias in my garden next year, Corinne. 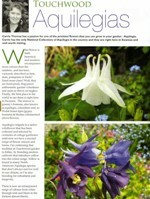 AQUILEGIAS... but not as you know them! Plant Support Trial for AQUILEGIAS... results. Article I wrote of my results here at Touchwood. 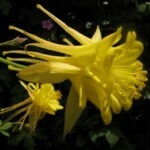 Double Yellow Aquilegias: Sun or Stars? I have a problem, one shared with many NC holders: how to be sure that my specimens are true-to-type: an especial nightmare when it comes to promiscuous Aquilegias that are only propagated by seed rather than clonal material. The other NC holder, John Drake has been very knowledgeable but there remained many unanswered questions. 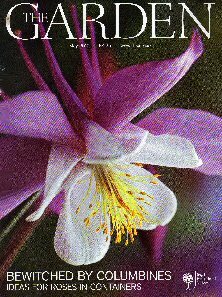 Eventually, I decided to start an Aquilegia Interest Group in order to start answering the many questions of identity. It started humbly as a correspondence round but as more people joined it soon became too cumbersome taking over 7 months to make the first round of 16 members. Instead we decided to form an e-mail group as only 4 members didn't have e-mail (and they've been paired up with a 'buddy' who sends them print-outs every month). Such groups make discussion easy...even between continents! Sending an e-mail automatically sends it to everyone in the group, and it's easy to reply in the normal way. 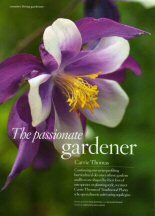 Members include the two NCCPG collection holders, Ray Brown who breeds Aquilegias at Plantworld, and Bob Nold who wrote the monograph. 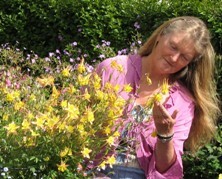 Interested in joining the Aquilegiachatlist? Simply add your name at the Yahoo mailing list site at http://groups.yahoo.com/group/aquilegiachatlist/ If you are already a member of Yahoo Groups you'll need to remember your member name and password....if not already a member, be prepared to create these two items. Membership is free, and whilst on the site you can also browse to see what has already been written, and there are files and pictures there. If you have any problems joining, or want to ask me any questions, you may contact me. I can also send you the resumes of what's been discussed so far. Not only has cultivar identity been discussed, but labelling, sowing, growing, pests and diseases, and even the vexed question of how to define a cultivar. Subject matter is up to each one of us....just ask what you need to know.